Renowned photographer Cindy Sherman has made her formerly private Instagram account public, allowing anyone to view and follow it. 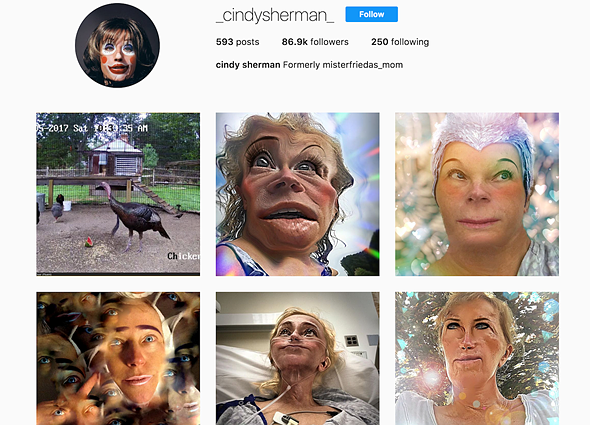 Sherman first launched the Instagram account last October under the handle @misterfriedas_mom, but has since been changed to @_cindysherman_. The account currently features nearly 600 posts and is growing like gangbusters—in the last two days alone her follower count has risen by nearly 30,000 to a total of 87.2K as of this writing. Sherman—who is well-known for her critical self-portrait work following the release of her Untitled Film Stills project—has shared a variety of distorted and otherwise surreal selfies on Instagram, as well as more mundane images from her life. According to The New York Times, she uses the app Facetune (iOS | Android) to modify her selfies in extreme ways… this is probably one of the few times you’ll see selfies identified as bona fide art. When she spoke with The New York Times early last year, Sherman said that social media “seems so vulgar” to her, but the draw of Instagram was too much. Several months later she launched a private account, and this weekend she finally opened it up for everyone to see. Why exactly she has decided to make the account public isn’t clear, but fans of surreal self-portraits taken by MacArthur Genius Grant recipient have a new must-follow account to check out.